This tab is where all of the profiles are stored for both panel design and spec specific key bindings (i.e., Key Layouts). Quick: You can use the default profile for Bit’o’grid to get a grid-like look to your frames as a starting point. Advanced Set-up: Vuhdo provides a way for you to set-up and use profiles. These profiles cover most of the settings in the Panels tab including positioning and sizing. In fact, you can set-up different profiles for different sizes of groups or raids that differ in appearance completely and load automatically depending on your group or spec. Note, once you’ve saved your profile, the Lock option under Settings stops accidental modifications when you’re just trying things out since vuhdo tends to periodically save changes. Quiet will suppress all the messages that vuhdo sends to your chat window to inform you of the profile changes and saves. Under Profiles, there are two default options. 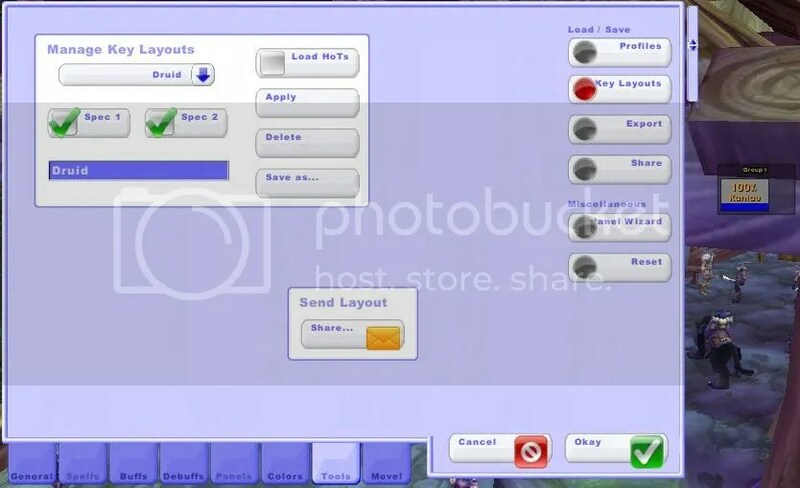 Vuhdo’esque looks like default UI frames that are slightly horizontally stretched. Bit’o’grid makes your vuhdo frames look very much like default grid profile. If you are starting with a Grid layout in mind, load that profile and start your changes from there. Quick: Not needed for the quick set-up unless you are trying to do a quick set-up for a second character. Advanced Set-up: This pane contains options save two sets of Spell bindings and hot settings and then automatically switch depending on which spec is your current spec. Advanced Set-up: Custom debuff exporting can be used to export your custom debuff list and save it that way. You can also import it to your other characters and easily load it for speedy debuff setup. Quick: Not needed for the quick set-up. Advanced Set-up: This panel is used to adjust the layout order within your raid panels and add additional panels. You can adjust by groups, classes, roles, or unsorted. The unsorted option could be useful for pvp profiles to prevent unit frames from jumping around when players join/leave a battleground mid-fight. 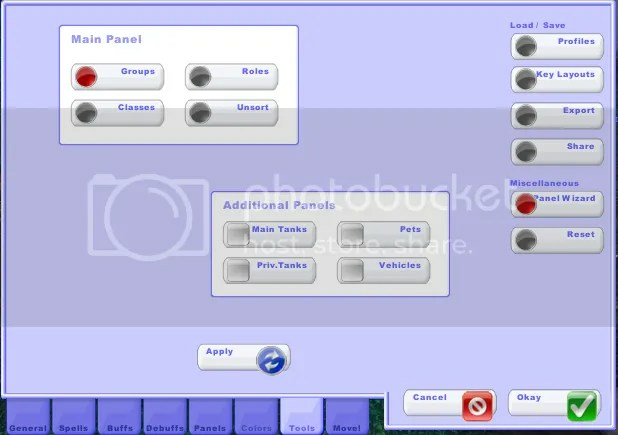 The Additional Panels section allows you to add Main Tanks, Pets, Private Tanks, and Vehicles frames as a separate panel, but you can also add all of these panels manually using the Move! tab. This where you go to make sure all of your settings are effecting your panels the way you intend. Advanced Set-up: Selecting Add new Panel creates a new empty panel; you can have up to 10 panels. To add sections/components to it, select the green plus button on the left side of the panel. This adds a single group; you can select as many new groups for your new panel as you want. To adjust the positioning of each group within a panel, click on Drag Me, hold the mouse button pressed and drag the groups around within a panel. 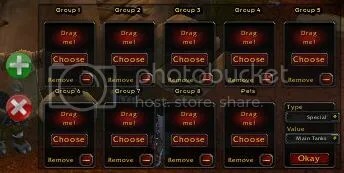 To adjust what the group will show, select Choose or click on the group. Two drop-down list boxes appear; the first selects the type of sort order the panel group will use (i.e., group, class, or special) and the second provides options when special is selected. Selecting group allows you to identify which group you show, groups 1-8 (or more if you want) as well as Own Group, allowing you to make position of yourself and your group static within a panel if you want. Selecting class will sort the members you are grouped with according to their class (e.g., priests). Special will give you options in the second menu like pets, private tanks, main tanks, self, own pet. 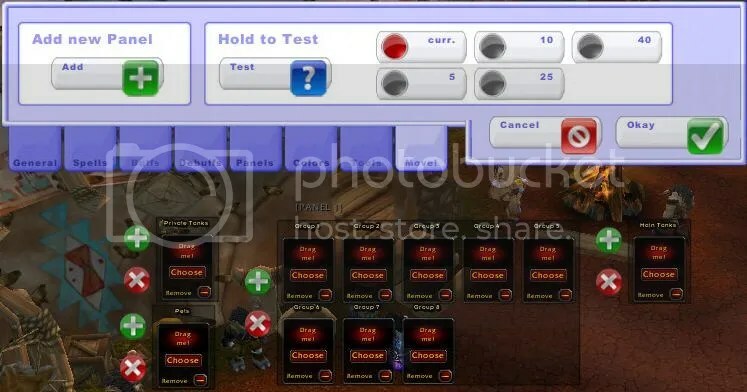 The Hold to Test button is there when you’re creating your profiles and want to make mock raid views of various sizes so you can decide on your panel placement, sizes of health bars, coloring etc. You can click on the hold to test button to view it once you select the size. 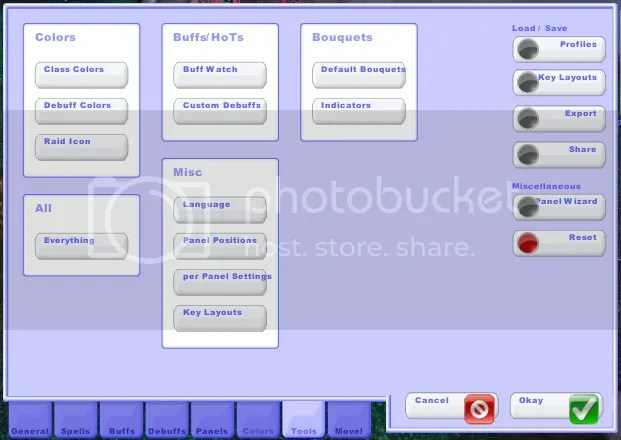 The mock view size will be preserved so you can adjust all the panel specific properties while looking at it directly.